Why can't I download iOS 7 on my iPhone 3Gs? I am unable to download iOS 7 on my iPhone 3Gs. Why? I have iOS 6.1.6 and if I want to download "Find My iPhone", it requires iOS 7. I've tried to search on what else I can do, but cannot figure it out. I also have about 10 GB of free memory out of 13 GB. You cannot download it because iOS 7 is not supported on any iPhone model prior to the iPhone 4. The latest version of iOS that will run on the 3Gs is iOS 6.1.6 -- which you have. 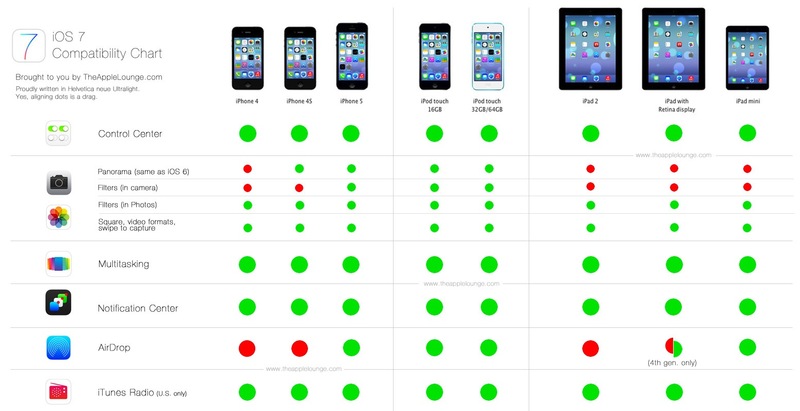 Note the complete absence of the iPhone 3G and 3GS models. If you purchase an app (free in this case) before the app is upgraded to require the next OS version, you can get the latest compatible version for your device. I have a 4th-gen iPod. It runs up to iOS 6.x. At one point I installed various Apple apps like Find My Phone/Friends. I recently wiped it and set it up for wifey to use. She had, naturally, no apps in her new account so she cannot install Find My Friends. I used my iTunes account to install Find My Friends and was able to get the last compatible version for my/her device. It will likely work until the server is updated and stops supporting older versions. Apple has a work around for older devices. Download the latest app to your computer with iTunes. Then log into the store with your device and select purchased. Find the app(s) for iOS7 you downloaded to iTunes and then select install. If an older version (i.e. iOS6) is available it will download. I have recently bought an iPhone 5 from Tmobile and before that I had a 3gs. The 5 wasn't working properly, so I took it back to Tmobile to get my 3gs back again. The man at the counter transferred everything to my old iPhone, and along with it, came iOS 7. I'm writing this to say it can be done, but with a lot of hassle, a waste of money, and a lot of stupidity. Not the answer you're looking for? Browse other questions tagged ios software-update . Remove iOS 5.1 notification from the main screen? How to install Dropbox on iPhone 3GS? how can I download ios 7 manually to be able to get my podcast app back? Can I download free apps without a payment method? Does iOS download iOS updates when using a hotspot?